Imagine you have a brilliant business idea and all you need is data!!! Data is sitting pretty on a score of websites you know, like the back of your hand! You know exactly how you can leverage data for your specific purpose. How to fetch and scrape the information in a quick and easy manner??? Whether you are from a technical background or not, you might be clueless about where to start. Whether you will be able to scrape the information from a website might be the ultimate puzzle! The answer to you puzzle is YES! Of course, it is possible and you can scrape date from any website even if you are not a programmer! However the BIGGER question is HOW??? To answer this question, we have put together this ULTIMATE GUIDE for you so that you can start scraping information from different websites! 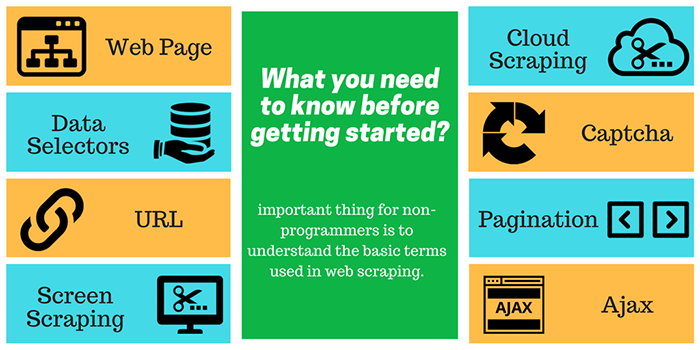 All you need to do is explore this guide and understand the basic concepts and terms of web scraping. This will enable you to unlock the world of web scraping for you. Remember, you can turn your business idea into a profitable enterprise with web scraping. In simple terms, web scraping is a technique to fetch data from a website. It uses the URL of the website for this purpose. It is also known as Web Harvesting or Web Data Extraction. Remember that data does not mean only the textual content on a website. 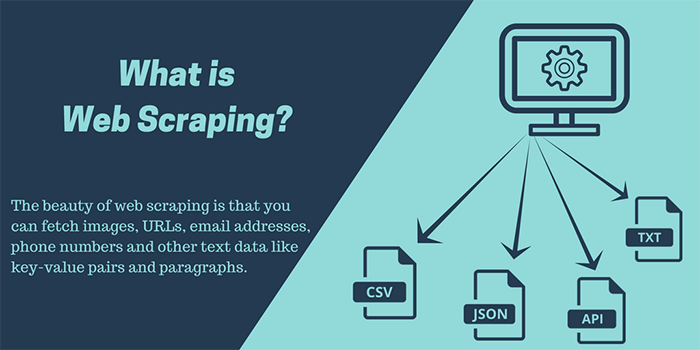 The beauty of web scraping is that you can fetch images, URLs, email addresses, phone numbers and other text data like key-value pairs and paragraphs! The process is astonishingly hassle-free. You are in complete control here! You can scrape data from similar or different types of pages from a given website. Guess what, you can easily retrieve the scraped data and store it in your computer, like saving any other file! You can select the format of your choice as well. You can save it in Text, CSV, JSON format or it can be continuously accessed using API! Web scraping sets you free because it allows you to easily fetch data and save it in your own way! Believe it or not, web data grows at an astronomical pace. More than 2,00,000 new pages get added on a daily basis on the world wide web (WWW)! Remember, there is limited time at your disposal and you cannot afford to reinvent the wheel! For business success, you need to be armed with data and carefully watch as the web unfolds. You access plenty of data from different websites. It is possible that you may want to use the data you access for different purposes. It may be to keep a close watch on prices of different products, analyze given data and/or reuse the data for diverse statistical purposes. Unfortunately, websites or web browser does not provide the facility to save or download a copy of this data use or access it again. Copy and paste of data is at times not possible or viable considering the quantum of data. There is a simple way out! Web scraping can accomplish this task automatically in a jiffy! How to Carry out Web Scraping??? The advantages of web scraping are probably clear to you by now. HOW TO DO WEB SCRAPING??? If you are a programmer, you can easily use languages like Python, Perl, PHP, JAVA or R for web scraping. But if you are not a programmer, you can use readily available software and tools for web scraping. You can fetch data using different techniques such as Screen Scraping, Cloud Scraping etc. Web scraping is all about instructing your computer to identify and access specific pages in a website and scrape specific data. Do you know how companies make their everyday decisions? To succeed, businesses rely on data. To continue to remain successful, they rely on more data!!! Whether it is to track the competitors’ pricing, customer’s purchase behavior or new market trends, businesses absolutely bank on data to make big business decisions. Remember, these are business strategies which can cost billions of dollars! That is why they rely heavily on data to work out an apt strategy for the given market conditions. Data gives them the edge over others in conceptualizing present strategiyes and future plans. Usually, data is incredibly huge and inherently dynamic, subject to change every moment. But here’s the good news- web scraping has caught up with this and evolved to the extent that it can help you get the data you want! Guess what, it is hugely cost effective as well! In a nutshell, you can understand its benefits through this tiny video here as well. So you decide to collect it manually from multiple websites. Copy-paste and manual collection of data can drive you crazy, right? A nightmare you don’t want to go through, do you? The key benefit of web scraping is that it is an automatic process and requires least human intervention or effort. Yet, it thankfully provides error-free data! Guess what, some web scraping tools are so amazing that they provide only unique records and removes duplicate data on their own. Who wouldn’t want such a great benefit??? ‘Time is money’ is a cliché! Time is invaluable in business and timing is everything!!! The key reason why time is crucial is that you succeed only if you stay ahead of your competition! Whatever saves your time, gives you a competitive advantage and time to carefully strategize. That is why web scraping is the key to success in business. It SAVES time and allows you to race ahead of everyone!!! 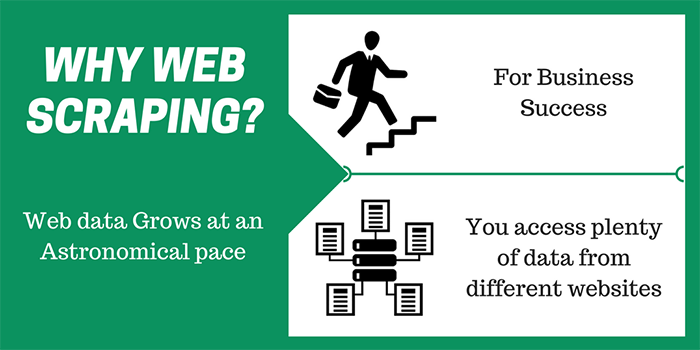 In this case, web scraping is a huge advantage as it uses multi-computing environment to scrape data and provides lightening quick output! To rise to the top is perhaps easy; to stay on top is incredibly difficult!!! Let’s say you acquire early business success due to one or another strategy. But to sustain the success and remain on top, you need to respond to changing business climate. Even you have to anticipate the upcoming trends and new strategies by your competitors. The question is how will you predict the future trends and competitor’s strategies??? You can work out your strategy ONLY IF you know the strategy of your competitor or market trends. You can take fundamentally important business decisions only if you know the business realities in detail. For example, whether your competitor has decided to reduce the prices or provide discounts or none of the two is a decision which can make or break your revenues!!! This will all happen online in the blink of an eye. You need to keep track of all this in an automated fashion to respond to it! Here’s a simple solution- you can scrape the data data from your competitor’s website and analyze the data to take your business decisions! This enables you to remain updated and take right business decisions in the nick of time! you can access all the data from one place. You can choose the format and the way it should be available to you. This allows an ease of access and makes life easier in analyzing the data! You will take no time to analyze it and can take your business decisions, QUICKLY! 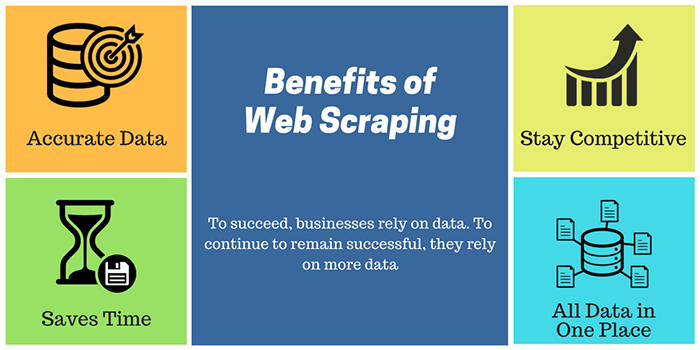 Now you understand what web scraping is and its benefits. What’s next? 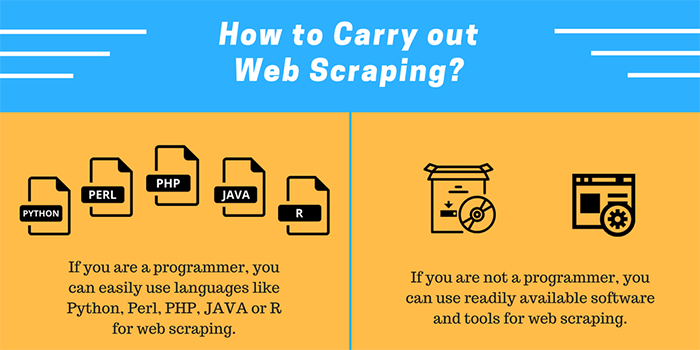 The next important thing for non-programmers is to understand the basic terms used in web scraping. Web Page- is a page you access on your web browser. A web page may contain a lot of information like news, how-to articles, stock prices, deals on shopping, just to name a few. URL- is the address of a Web Page. This is what you type in the browser to access a website. Data Selectors- is a technique developed by web scraping software. You can use it to select data from a web page to be extracted. Usually, you put the cursor on the data and selector will give you options. You may want the element to extracted or all similar elements from that page. You can find types of selectors here as given below. Screen Scraping- is a method to extract data from a web page when the page is open in a browser. Cloud Scraping- uses the URL of a webpage without having to open a web browser. Captcha- distinguishes human from machine input. Many websites use it to prevent automatic extraction of data. Pagination- is a sequence of number assigned to a webpage. It is a feature websites use to divide it into pages. Ajax- is a technique to make interactive web pages wherein user requests are processed immediately. It displays the data without having to refresh a whole web page. You need to install web scraping software on your PC. Mostly the software available are Windows based. The key to take optimal advantage of web scraping is to have clarity of need first. So define your need first. To achieve this, make a list of points. Do I want to scrape information from one website or multiple websites? Do I want to scrape information from single page or many similar pages? If I want to scrape weather data of my city or annual reports of a company, does it involve scraping data from one page or multiple pages? If I want to extract prices of items from an e-commerce website, does it involve scraping data from multiple pages? What kind of information do I want to scrape- email addresses, text, phone numbers or images? What is the format in which do I want my extracted data? Can I wait for the data or do I want it urgently? What are my budgetary provisions? Am I running low on budget? Or do I have sufficient budget? Am I able to afford only medium-quality of software or tools with a low budget? Or can I afford high-end software or outsource it to the best web scraping agency? Do I want to scrape data once for a specific purpose or quite frequently e.g., hourly, daily, weekly monthly or on a regular schedule? Do I want to get phone numbers of companies from a web directory website at least once? Do I want to get the phone numbers of newly added companies so that it generates new sales leads? What to Expect from Web Scraping Tool??? 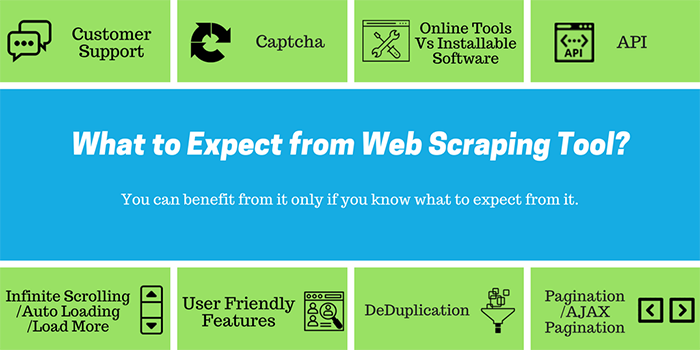 Let’s say you get a web scraping tool, do you know what to expect from it??? 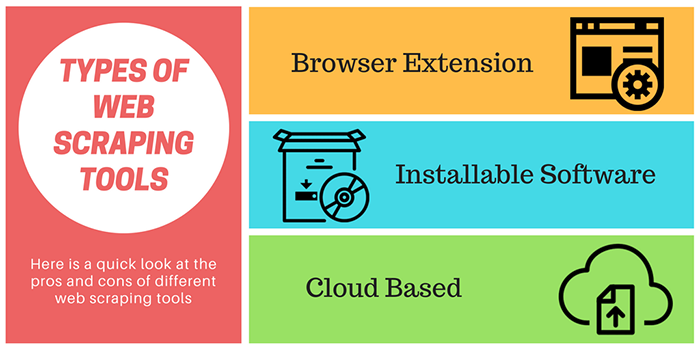 Now that you understand web scraping and are clear about what you want to achieve using a web scraping tool, it’s time to find out which tools can help you. You can benefit from it only if you know what to expect from it. The good part is that we have listed 12 key benefits/services/features you should look for in a web scraping tool. All points listed here may not be relevant to your need but we have listed them to help you see the big picture. Web scraping is not as easy a task even when you use extremely sophisticated tools. As a quick learner, you may immediately pick up a few things but you may still not be able to do a few things on your own. That is why it is necessary to get support from the company or service provider. So having good customer support is the key criterion for selecting a tool or service provider. You will find many fascinating and sophisticated web scraping tools but you should select a tool based on how user friendly it is. If it is easy to understand and use, it can help you extract data without any hassle. If it is tricky and consumes time and energy to perform simple tasks, you are losing out on the time advantage. Remember, you are investing in a web scraping tool so that it saves time. Make sure you select a tool that serves this purpose. It should be simple in application, easy to maneuver and effortless in operation. If you decide to use installable software, you need to configure it and run it, keep watch and stop it. You need to do everything on your own on your PC. This tool has a few limitations as mentioned earlier. You also need to consider the kind of hardware and operating system required for the software. If you decide to use online tools and their cloud web scraping infrastructure, you will need to merely configure the web scraper and the rest of it will happen on its own. You will not need to star, watch and stop it. Once scraping is completed, it will produce your scraped data in the formats/modes of your choice- CSV/XLS/API. That is why online web scraping tool with cloud infrastructure is far more preferable in most of the cases. You may want to scrape information from pages containing list of items. It is quite common to have pagination as all items cannot be displayed in a single page. In such cases, you need to make sure that you configure web scraping tool accordingly. It should go through pagination and collect items. Most of the tools do support pagination in some form but it is better to make sure you look for it before making a purchase decision! Modern websites use auto loading approach to seamlessly list the item when you scroll a web page. It saves time to load page because it requests more item from the server and displays it without refreshing the page. So you need to select a tool that supports web scraping from pages with auto loading. Make sure you check this before you go for a web scraping tool! Typically, a website displays information in a particular structure. For instance, on an e-commerce website, you will first get to see categories of items. So let’s assume you want to scrape information from an e-commerce website. It means you would want to scrape all the categories and then the items as well. This requires what is known as ‘Tree Support’ which is just an easier term to understand it. That is why it is vitally important to look for a tool that lets you scrape the categories first. It should then give you input for the next task- fetch items from the categories. So make sure you select a tool that provides ‘Tree Support’ and allows you to scrape the data smoothly! As discussed earlier, websites use captcha to prevent the data extraction. So you need a tool that invariably comes with anti-captcha facility to automatically solve captcha. In selection of a tool, you should be careful and never miss out on anti-captcha provision in a tool! You should keep it in mind that some web scraping tools or services provide you only updated information after the last run of scraping. But in the case of some tools, you might get all the data every time you use the tool. The key is to look for a tool that provides DeDuplication facility. It will save you time from all the hassle and provide you only the update information from the website. Alright, let’s say you scraped the data that you needed. Now what??? You would naturally want to enter the scrapped data, analyze it and take some decision. The good part is that some tools come with API support which enables you to enter your scrapped data and analyze it. So make sure you look for a tool that provides API support, without fail! Here’s the best part, if your tool has API support, it can operate automatically, stop on its own and scrape the data as it wants! To sum it up, make sure you select the right kind of web scraping tool or service provider that provides good customer support and cloud based infrastructure. If you look for the features and facilities mentioned above, you will have no trouble whatsoever in your web scraping mission!!! Imagine you have a brilliant business idea and you know all about web scraping, what is the next step??? You need to get started with your web scraping!!! Initially, it may be slightly tricky but you will surely get the hang of it with study and practice. This guide should enable you to kick-start your web scraping adventure! And you would need an advanced guide to web scraping only if your web scrapping needs are far more complex. ‘The Ultimate Guide’ is all you need to capture and use all the data you want. Wish you happy Web Scraping!! !